For wet/dry stripping use to prepare floors for recoating; conforms to uneven floors. Designed to be washable and reusable, lasting up to 25 times longer than other floor pads. Quickly and easily cuts through old finish. Application: Stripping; Diameter: 19"; Color(s): Brown; For Use With: Rotary Machine Speed of 175-600 RPM. For wet/dry stripping use to prepare floors for recoating; conforms to uneven floors. Designed to be washable and reusable, lasting up to 25 times longer than other floor pads. Quickly and easily cuts through old finish. Application: Stripping; Diameter: 13"; Color(s): Brown; For Use With: Rotary Machine Speed of 175-600 RPM. Both aggressive and very conformable, 3M Brown Stripper Pad 7100 can be used in wet stripping, dry-foam stripping, and deep scrubbing processes, performing well even on bumpy, irregular, or worn floors. 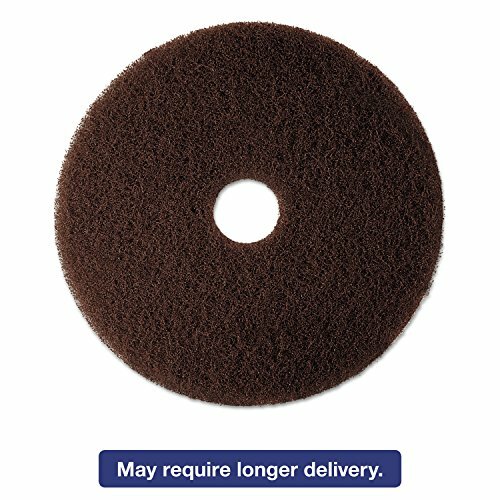 When used in a heavy-duty scrubbing process, the 3M Brown Stripping Pad 7100 will remove up to 2-4 coats of finish in preparation for refinishing. With appropriate cleaning chemicals, it can be used to clean heavily soiled hard-surface floors such as concrete. The pad is uniformly permeated throughout its open construction with resin and mineral abrasives, providing impressive performance and a long, useful life. Application: Stripping; Diameter: 14"; Height: 1"; Color(s): Brown. For wet/dry stripping use to prepare floors for recoating; conforms to uneven floors. Designed to be washable and reusable, lasting up to 25 times longer than other floor pads. Quickly and easily cuts through old finish. 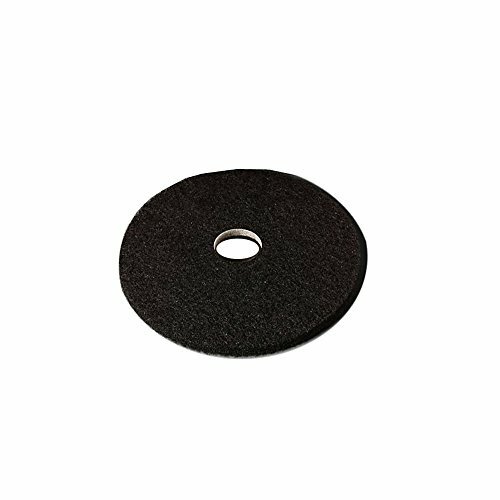 Application: Stripping; Diameter: 14 in. ~ Includes 5 pads per case. For wet/dry stripping use to prepare floors for recoating; conforms to uneven floors. Designed to be washable and reusable, lasting up to 25 times longer than other floor pads. Quickly and easily cuts through old finish. Application: Stripping; Diameter: 20"; Color(s): Brown; For Use With: Rotary Machine Speed of 175-600 RPM. 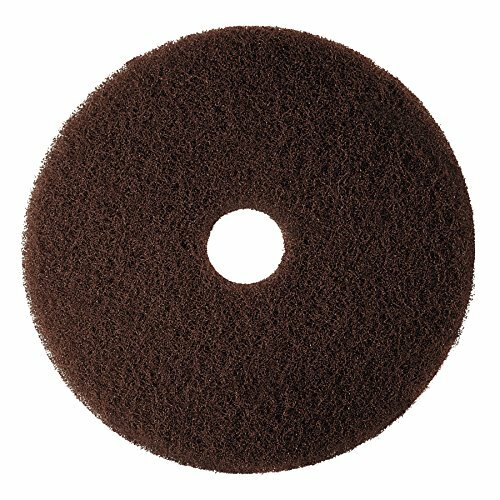 Both aggressive and very conformable, 3M Brown Stripper Pad 7100 can be used in wet stripping, dry-foam stripping, and deep scrubbing processes, performing well even on bumpy, irregular, or worn floors. 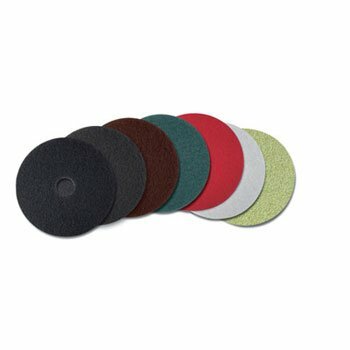 When used in a heavy-duty scrubbing process, the 3M Brown Stripping Pad 7100 will remove up to 2-4 coats of finish in preparation for refinishing. With appropriate cleaning chemicals, it can be used to clean heavily soiled hard-surface floors such as concrete. The pad is uniformly permeated throughout its open construction with resin and mineral abrasives, providing impressive performance and a long, useful life. Application: Stripping; Diameter: 16"; Height: 1"; Color(s): Brown. Looking for more Low Speed Brown Stripping Floor similar ideas? Try to explore these searches: Olympus Digital Compact Cameras, Bravado Sublime Nursing Bra, and Angelo State University.